Don't bury the lede: What's the real story behind a UI interaction? A user interface designer, like a journalist, should avoid burying the lede: engaging the user with an opening question or statement that omits the most critical point of interest. The lede is the all-important opening sentence of a news story, and journalists labor over them. User interface interactions have ledes too, and they should be crafted with as much care. Can you see the disaster in progress? Most users can't either. This dialog has buried the lede. 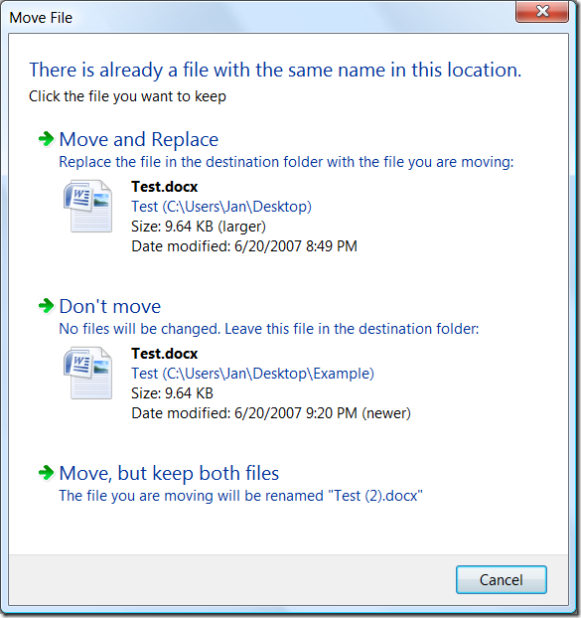 It focuses the user's attention on the fact that there is another file with the same name in the destination folder. It fails to point out a much, much more interesting condition: The user is about to overwrite a newer file with an older file. Overwriting a file is not, by itself, an uncommon or bad thing. 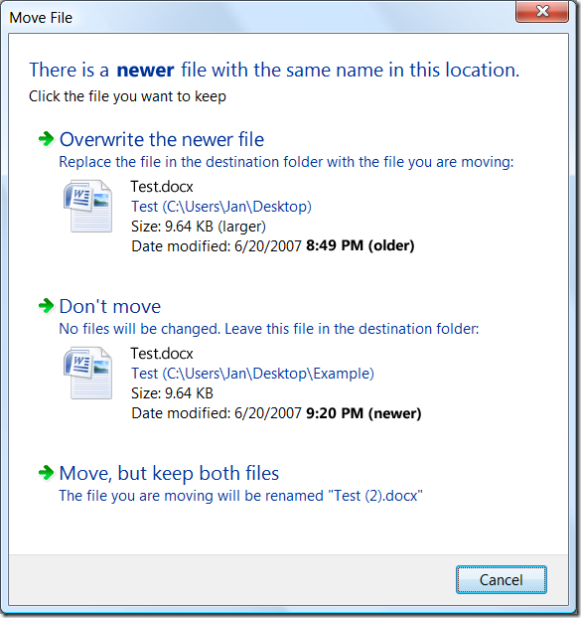 It is a daily occurrence for users to overwrite an older file with a newer version of that same file. 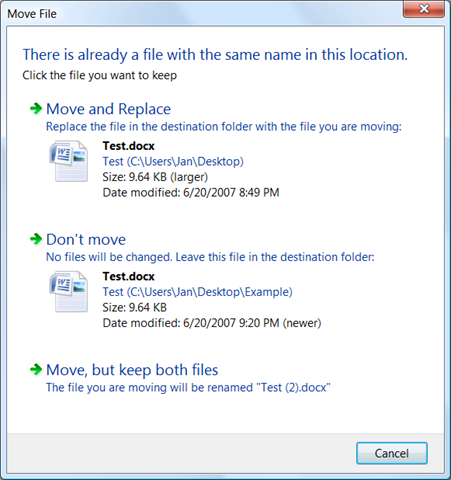 The user may be posting an updated copy of a document to a backup location, or to a server for use by others, or to removable media for transportation elsewhere, etc. This is business as usual. 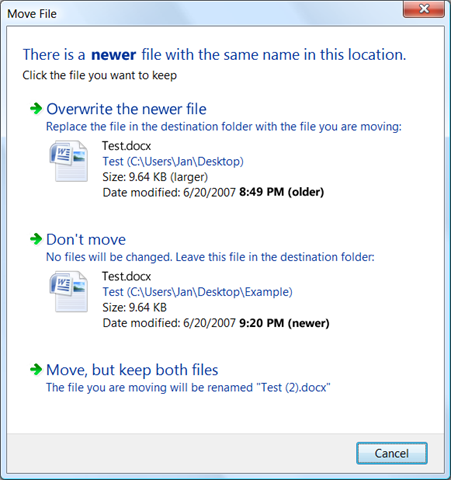 Going the other way—overwriting a newer file with an older files—is a much rarer event. The user might be giving up on work they've done and throwing it away. Alternatively, they could be restoring a backup file to replace one that has become corrupted. Either event is unusual, a point which should be emphasized in the dialog. As just a very first cut at revising the above dialog to restore the lede, some text could change. The typography could be tweaked to focus on the salient time stamps. A different sound is probably also in order, to distinguish the invocation of this dialog variant from the more normal one above, and emphasize that something unusual is going on. This revision would clearly needs a ton more work, but is a start in the right direction. At least the dialog now opens with the lede. 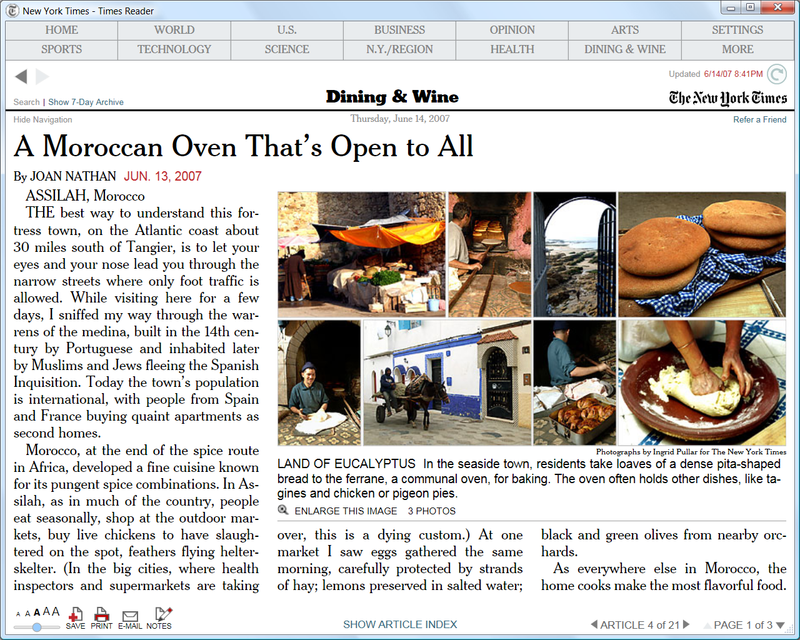 For the past month I've been playing with Times Reader, a Windows client application for browsing the New York Times. I think the computing industry has been promising this sort of digital newspaper for, oh, 30 years or so, so it's nice to see it finally happened. I remember reading about early prototypes of digital newspapers in coverage of work at the MIT Media Lab in the 1980s. The basic idea is that the computer would download news articles, then use principles of layout and typography to create a result that was optimal for browsing and reading on the user's display. Since then we've seen the advent of newspaper web sites, but in my opinion, none of them offer anything close to the pleasure of reading a paper newspaper. In general, Times Reader effectively realizes the original digital newspaper vision. It makes intelligent layout decisions that maximize legibility, achieve a reasonable aesthetic appearance, keep articles on one page if possible (to avoid scrolling), and allow for advertisements. It also renders type exceedingly well by using ClearType. I find Times Reader actually does deliver a more newspaper-like reading experience. When I don't have a chance to read the paper edition of the Times, I enjoy catching up in Times Reader over reading the basic nytimes.com site. That said, I'm not sure many people will find the experience so much better that it's worth a download and the additional hassle of using a separate application. According a Microsoft press release about Times Reader, the application is developed in Windows Presentation Foundation (Avalon), which in turn requires the Microsoft .NET framework. (Interestingly, the ads appear to be implemented in WPF as well, so the marketing verbiage can also be rendered in gorgeous ClearType.) If you've got Vista, the install isn't a big deal, but Windows XP users will probably struggle. I've found some practical issues with Times Reader as well. In theory Times Reader has a component that downloads and caches content when you're not running the app itself, but this doesn't seem to always work. At least, in my experience, I've found that I sometimes boot the app only to discover that the content is stale. A progress indicator in the corner spins for several minutes to let me know it's working, but as new content begins to appear (over many minutes), I have no way of knowing which content is stale and which is fresh. 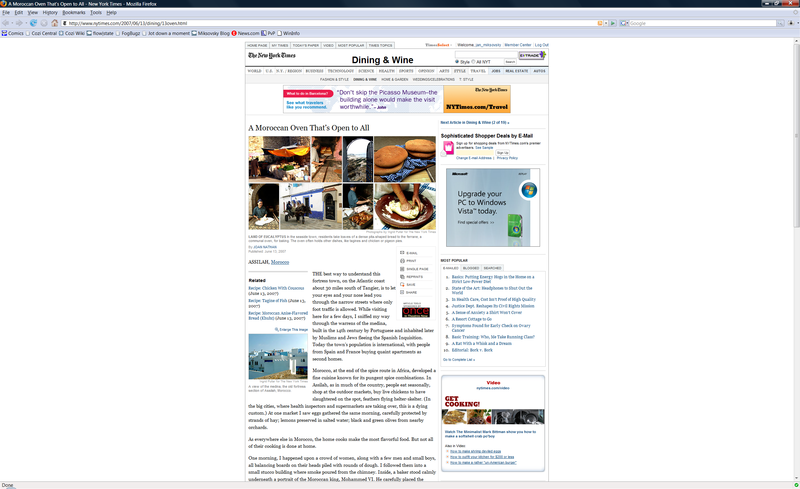 Moreover, Times Reader uses a newspaper-style columnar layout for the section summary pages. These look great, but their minimalist appearance unfortunately leaves the reader wondering which articles are the most recent: is the article in the upper left the most recent, or the most important, or some combination? Finally, while Times Reader does a better job than a browser at rendering a page of content, the actual browser frame of the application is unremarkable, and it's tiresome to use a separate browser just to read one site. I'm looking forward to seeing Times Reader rewritten in Silverlight so the entire thing can just run in the browser. I think it's interesting to note that Times Reader omits a feature always stressed in early digital newspaper prototypes. Those demos invariably showed off a user's ability to selectively express interest in certain types of news. ("In the future, we engineers won't have to even see the Sports pages!") By now, most news sites don't make a big deal of this sort of personalization. If someone's really interested in a particular topic, they can either set up a news filter for it or, more likely, just visit a specialized news site focused solely on that topic. If someone's uninterested in a topic, they can just ignore it. I first saw early demos of Times Reader several years ago and it's frankly stunning that the product actually broke through to see the light of day. It's exactly the sort of technology collaboration that sounds so great in principle, but in practice is hardly ever pulled off. Kudos to the Times Reader teams at both Microsoft and the New York Times for their success in bringing this to fruition. A few months ago I came across Geni, a genealogy site that offers the slickest trial-to-signup path I've seen yet. I wanted to post on Geni, but to appreciate how good a job they do, I thought it was useful to look at old school sites, where signup is one of many hurdles to site usage, and new school sites that avoid some of these hurdles through the use of anonymous accounts. Geni goes beyond all the rest in creating what, in my opinion, is the most inviting initial user experience for a site to date. It's not advertised to the user at this point that the email address they enter for themselves will become their user ID on the site. This is revealed the first time the user tries to return to the site. At that point—the second visit—the user is asked to sign in with their email address and a temporary password that was emailed separately to that address. Click-wrap. You must explicitly check a box or comparable control to indicate that you agree to the terms. This presumably confers stronger legal protection for the site, because it would be harder for a user to claim that they were unaware of the terms. DISCLAIMER: I'm not a lawyer, and you would have to be a complete idiot to base a legal strategy on the content of this blog without consulting an attorney. Most services that require accounts go for click-wrap terms, hence the ubiquitous "I agree to the terms and conditions" check box found on service signup pages. The site feels obligated to obtain explicit agreement because the user and site are forging an ongoing relationship, and each future interaction could increase the likelihood a legal issue might arise. The downside is the "I agree" check box becomes just another hurdle in the way of the user trying out the service, and creates another opportunity for the user to decide they'd rather just walk away. The Geni site is worth checking out for their signup experience alone. The other thing to marvel at their intensely viral proposition. 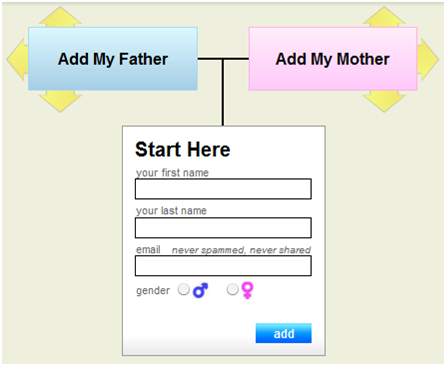 Genealogy lends itself to reaching out to people you know, and they make it drop-dead simple to enter a relative's email address and invite them with a single click. The beauty of this is that you get to offload all the data entry tedium to the one or two relatives in the family that actually enjoy that sort of thing. Everyone in the family receives the benefit of their work—as does Geni.